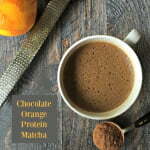 This chocolate orange protein matcha drink is a great way to start your morning. Added protein and matcha green tea will give you a boost of energy and it's only 3.7g net carbs so it's low carb too. Boil or heat up your water. In a high speed blender add all your ingredients. Blend on high for 10-20 seconds.